This tutorial describes how to start working with DéjàClick for Google Chrome. If you do not have Google Chrome installed, you can download it from here. Click Download, accept the Terms of Service, and follow the Chrome installation instructions. Go to the DéjàClick Chrome Webstore page. Click the green Free button. Once the DéjàClick extension is installed, you will see the DéjàClick icon. You do not need to restart the browser for changes to apply. To use the DéjàClick Simulate New User feature, you will need to enable the Incognito mode for this extension in Chrome. For more information, see Simulate New User. Now that DéjàClick for Chrome is installed in your browser, you can record your first DéjàClick transaction. Start Chrome, and look for the DéjàClick icon in the toolbar. Click the DéjàClick icon to start the DéjàClick extension. You can hover over the icons across the top to see their descriptions. The top half of the extension window is the tree view. You will see your recorded steps appear here. The lower half will display results of the interaction with the web page and the properties of each item. Let us start with a quick 2-step web transaction using Yahoo as an example. You will need to enable "Incognito Mode" in Chrome (see Simulate New User). To start with a fresh Incognito window in Chrome, press Ctrl+Shift+N. This assures that the recording acts as a new visitor to your website. Click on the DéjàClick toolbar. Then, in the Chrome browser, enter www.yahoo.com in the address bar and press Enter. You will see your user event recorded in the tree view of the DéjàClick extension. 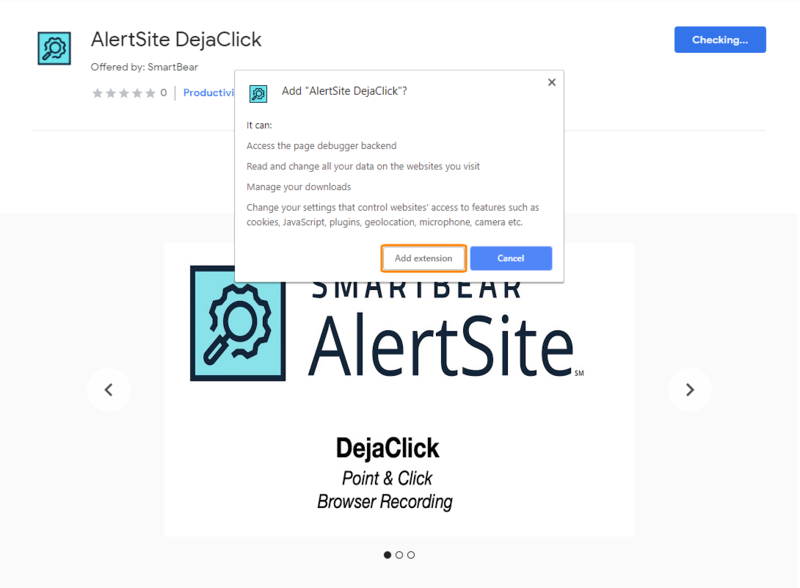 While DéjàClick does a great job of understanding if there is a web application error, using the keyword validation feature ensures the application is responding correctly and things are really working. For example, if you are the content manager for the Yahoo home page, you might want to make sure a repeatable piece of content always appears on the page. Click on the DéjàClick toolbar and select Add keyword validation. 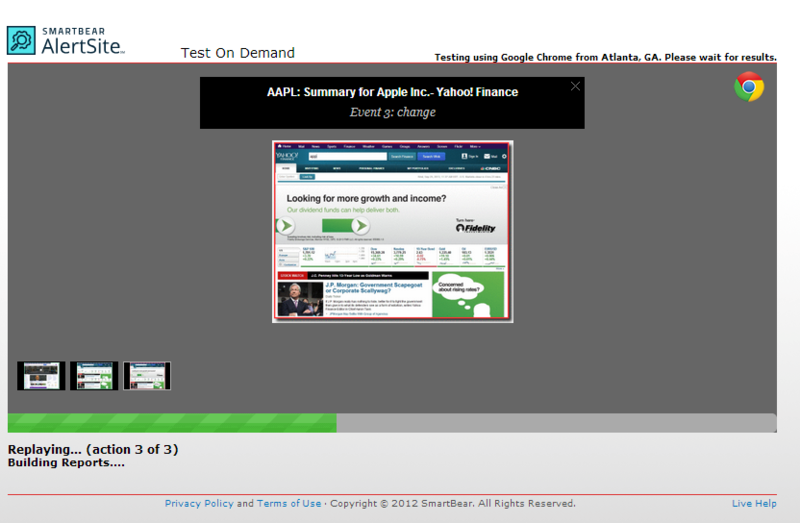 Then, point the mouse cursor on the Finance word at the top of the page and click it. The Add Keyword Validation dialog appears. Click OK to add the keyword validation. After you have added the keyword validation, just perform the next user interaction. Let us click on the Finance link to go to the Finance page. 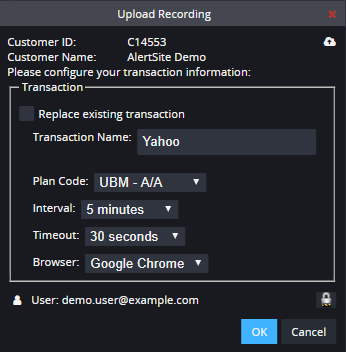 DéjàClick will add the step to the web transaction recording, making it appear in the tree view. Now that your script is complete, click Begin Replay to replay the script from your desktop. The DéjàClick extension performs all of your user interactions across the web page and records the results. Tip: You may want DéjàClick to run the script as if it was a completely new user. To do that, simply press Ctrl+Shift+N to open a fresh Incognito tab in Chrome, then click Begin Replay once again. You have just completed your first script! After the replay, you can review your script results. To do that, select an item you are interested in in the tree view at the top of the DéjàClick extension. The Results panel down at the bottom will show playback results. The Properties tab displays details about each event or action. Supported in DéjàClick Chrome v. 1.4.2.0 and later. If the script includes extra hover and click steps not essential for the transaction flow, you can delete them. To do this, select an action or event in the DéjàClick sidebar and press Del or Backspace, or right-click it and select Delete. To save the script to your desktop, click . Chrome will download your script as an XML file. To view it, click the Downloads link. Now that the script is saved, you can select it and replay it at any time. You can replay your script on any of the AlertSite world wide locations by using the Test on Demand feature. 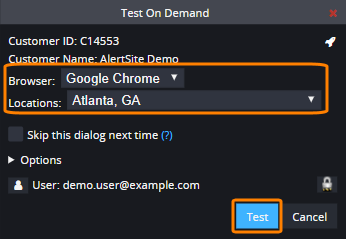 Test on Demand allows you to instantly verify your script on any of AlertSite monitoring stations. If you are not logged in to AlertSite, click to log in to your AlertSite console. Then click Begin Test On Demand. Select your browser and location and click Test. Test on Demand will run your script, showing you a screenshot of each action. When complete, Test on Demand shows you the script status. You can review each screenshot by clicking on the thumbnail. You can also view the detail or capture report. You can store your scripts on the AlertSite monitoring locations using your AlertSite account. Click Remote Service to open the remote services drop-down menu. This allows you to upload your recordings to a repository so you can re-use, share, and schedule them. Complete your information, determine the transaction schedule, and click OK. Your script is ready to run on your schedule and report results to your AlertSite account.